Bring your events to life with our visualisation service. Using our database of scanned locations, you and your clients can visualise and plan events while viewing in 3D, on mobile devices, desktop or in VR. Our visualisation, consultancy and production management services ensure a successful event. We capture data from locations and distribute it to those involved in planning events. We work with producers to visualise their work in any location. Our aim is to have the most comprehensive database of event spaces in the UK, bringing each location to your desktop or mobile device. Data capture exported in web GL: Best viewed in Firefox or Safari. Designers / Production Managers / Technical Managers / Stage Managers / Production Electricians and all associated technical staff networked to our data can now visualise their touring productions within the venues they are due to visit. Designers can place concepts on stage and view from any position in the auditorium or on stage, improving the quality of final design decisions. Technical teams can view from the wings or the grid and discuss how designs work with the designer or production manager. Technicians can place ground plans or technical plans into the 3d environment to ensure sight lines are good, lighting positions are optimised and stage settings are properly considered before you arrive. Venue specifications mapped onto the 3d data, enable touring teams to explore each venues technical infrastructure and prepare for their tour without the need for recce’s onsite. Overall planning capability is vastly improved using our network of visual data. Providing visiting companies with accurate information about your venue is vital to hosting a successful event. Become part of stageports database and clients will have access to a new standard of information that they can work within. Increased footfall to your venue from visiting companies networked to your site. They can tour your venue at any time from their desktop or mobile device. Increased confidence in your venue from producers when choosing which space to host their event. Enhance the quality of events designed for your venue by providing designers a vastly improved toolkit to work within. Your audience will enjoy the enhanced quality of the events you present. 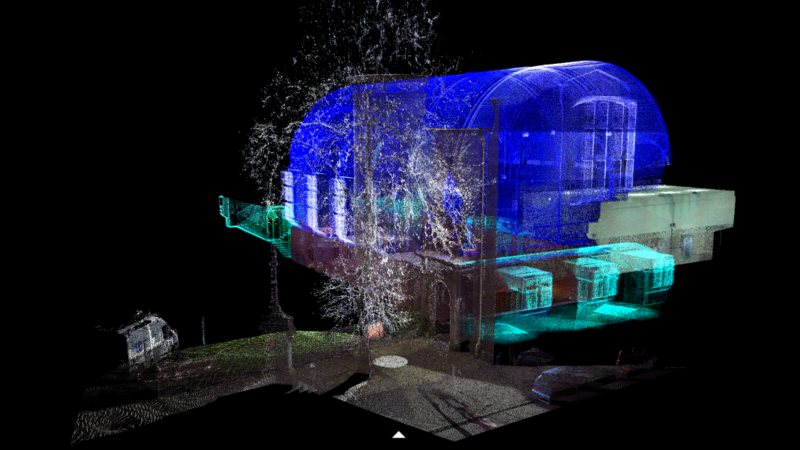 Once networked to our point clouds; producers, designers and creative teams can work collaboratively within each venue in 3d. Place your design concepts in the virtual space and view it from any perspective, while clients can access the data at any time through their internet browser. We capture data at your preferred location. We network you to the data in your preferred format. We work with you to visualise your production or event within the space you have in mind. We distribute relevant 3d data to prospective clients, designers and technicians, to their mobile or desktop devices or offline in 3d pdf. The Mcleod Hall, The Pearce Institute Glasgow.